CD reviews: "Now My Soul" and "Keepin' it Real"
These reviews first appeared in the Autumn 2004 issue of Turbula. Ronnie Earl has long had some of the most tasteful chops of any blues guitarist. He's not likely to win any speed contests, and most of the young punks coming up can probably shred his technique to pieces. But nobody plays with more soul than Earl. Every note he pulls from his guitar says something, every passage has meaning, every solo drips taste and class. Listening to Ronnie Earl play electric guitar is one of life's decadent luxuries  like sipping Dom Perignon, smoking a Cohiba or eating a box of Esther Price chocolates all by yourself. What Ronnie Earl is not is a front-line vocalist. If he were, people would have quit asking "Who's going to replace Stevie Ray Vaughan" a hell of a long time ago. Through the years, he's had a variety of different singers in his band, and even put out some instrumental albums. For his new album, he takes yet a different approach: Having a rotating cast of vocalists sprinkled among a half-dozen instrumentals. Kim Wilson, former lead singer for the Fabulous Thunderbirds, takes the majority of the work, handling four tracks. Wilson's bright, nasal voice is a wonderful complement to Earl's jazzy guitar leads  as is his trusty harmonica, which he brought along as well. "Black and White" is one of the best songs either Wilson or Earl has yet recorded, an uptempo shuffle with a catchy melody and a positive message about racial integration. The Silver Leaf Gospel Singers provide an old-fashioned leavening to "Walkin' on the Sea," a rousing contemporary gospel song. And former Roomful of Blues reedman Greg Piccolo sounds close to the late Jimmy Dewar, bassist and singer for Robin Trower's classic 1970s lineup, on "Feel Like Goin On." Of course, mighty though that Trower trio was, it never had anything like the organ work of Dave Limina to ground it or lend it a shimmer. 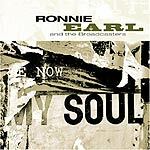 "Now My Soul" is one of Ronnie Earl's strongest albums in a career that's covered two decades so far. His solos retain their sharp edge, the song selection is strong, and the guest vocalists match his intensity throughout. 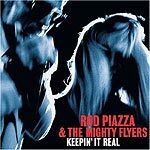 Rod Piazza and his Mighty Flyers have been among the most prominent exponents of the West Coast school of blues over the past two decades. With Piazza's impassioned harp playing and singing balanced by his wife Honey Alexander's barrelhouse piano and Bill Stuve's rock-solid bass, the Mighty Flyers have become one of the most popular live acts on the blues circuit. The addition of Henry Carvajal on guitar for the Flyer's new album adds yet another distinctive voice to the band's sound. While previous editions of the Mighty Flyers have featured such heavyweights as Junior Watson, Hollywood Fats and Rick "L.A. Holmes" Holmstrom in the guitar slot, Carvajal is the most tightly integrated into the band's overall sound. The others were primarily soloists, cats who wanted to be blues stars in their own right (and went on to such after their tenure in the Flyers). Carvajal certainly has the skill and talent to stand alongside those three, but he's much more of an ensemble player, apparently more concerned with how he can add to the group's overall sound than with how many solos he gets. Piazza's harmonica playing and vocals are as strong as ever, Miss Honey continues to get better and better on piano (she remains, in fact, one of the most underrated blues pianists on the scene  due at least in part, no doubt, to the fact that she's stunningly gorgeous), and the rhythm section just cooks. If there's a weakness here, it's the songs. Oh, there's nothing wrong with blues chestnuts like "Good Morning Little School Girl" or "Just Like a Woman" or "Baby Please Don't Go." But the first will forever be associated with the original Sonny Boy Williamson, Clarence "Gatemouth" Brown recorded a definitive version of the second, and the last has been beaten into the ground by repeated covers. The best spots on the album are Piazza's originals, songs like "Moving in a West Coast Way," "That's What She Hollered" and "West Coast Midnight Blues"  songs that are fresh and melodic and let the band show new facets to their playing. Miss Honey's "Buzzin'" is another treat, with its off-kilter opening on piano and New Orleans-inflected rhythmic figures that have more than a touch of Professor Longhair to them. She tears up the keys here, laying down a powerhouse 10-minute lead and brandishing chops comparable to Marcia Ball or Jeannie Cheatham. And Joe Josea's "Tick Tock" is a slick little rocker that the band rips up. On these songs, the Flyers are indeed mighty  one of the tightest, most powerful blues combos around, a band at the very top of its art.